Yalda celebrates the winter solstice, as the days become longer and the nights shorter in the northern hemisphere. In that sense, it spiritually celebrates the rebirth of the Sun Goddess Mithra (wall carving photo left). A deeply rooted ceremony, the annual observation of the winter solstice by Iranians and others signifies that man has known for thousands of years that THE SUN birthed all plant and animal life on our planet. 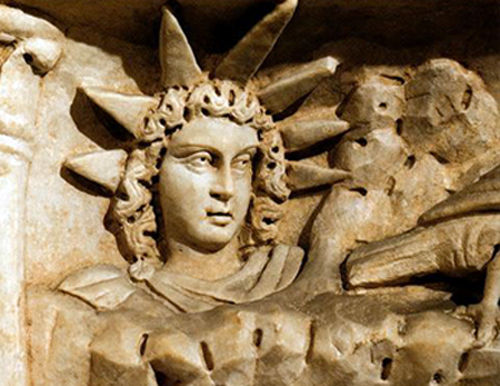 Moreover, ancient Iranians' ability to accurately predict the solstice and to know key moments on the solar calendar is directly related to mankind's survival, prosperity, ability to plan for the future, and ability to conceive of time. Yalda is so old that it even predates Zoroastrianism-- Iran's religion prior to the Arab invasion and largely forced conversions to Islam-- and is really a Mithraic holiday that would soon be adopted by Zoroastrians. Sometimes, it is difficult to conceive of a pre-modern, pre-industrial and pre-agricultural world and all its challenges to human survival. Cultivating a monumentalist relationship to history rooted in one's own heritage and longstanding annual rituals like Yalda is one way to spiritually surpass time and space and reconnect with previous epochs, in this case, one in which light was so rare and crucial as to be worshipped. Regardless of humanity's divergent cultures and mutually-exclusive religious traditions, there is a common source of energy that binds us all to a shared past and a shared imaginative and interstellar future. While there are some 6,500 distinct languages with their own words for 'light', there is only ONE SUN that birthed us all. Happy Yalda! Iran is "Officially on Notice" and Donald Trump is President. Now what? There are two possible Flynn-Bannon-Trump strategies on Iran worth considering. Since the 1979 Islamic Revolution, anti-American rhetoric has appeared frequently in Iranian politics. That rhetoric flared up again at the Supreme Leader’s recent speech in his home city of Mashhad. With the deadline for a political framework for a nuclear deal fast approaching, some have argued that Iranian chants of “Death to America” at that speech and elsewhere should delegitimise the negotiations. While the rhetoric isn’t helpful from an American perspective, its presence is counterintuitively a good sign for a diplomatic resolution. Look forward to hearing more provocative language from Iran’s Supreme Leader, and possibly even from the generally soft-spoken President Rouhani, from now until the ink dries on a potential comprehensive deal. Can US-Israeli relations be repaired after Israel’s election? The fallout from Israeli Prime Minister Netanyahu’s address to Congress on the nuclear negotiations with Iran poses an important question: is there a long-term structural fissure between the US and Israel, or is this simply a personality conflict between Obama and Netanyahu? With the Israeli elections coming up on 17 March, the answer is particularly important, as it indicates whether a change in leadership can resolve a potential structural fissure, or if it will simply mask over those deep policy differences with more welcoming handshakes and cosmetic smiles. Obama and Netanyahu certainly do not get along well, indicating that, at the very least, there is a real conflict between leaders. However, this personality conflict has metastasised to the extent that it has laid bare the significant policy disagreements on Iran’s nuclear programme and, to a lesser extent, the Palestinian issue.